We slowly leave the chaos of Hanoi traffic behind and head out on the open road for North East Vietnam familiarising ourselves with the 125cc Minsk Motoribikes as we go along. These bikes are sold into Vietnam as agricultural implements and certainly demonstrate their hardiness over the next few days. Buildings give way to rice fields and cone hats bob up from their field work to look at the posse of six riders rumbling past. I'm travelling with 4 MBA students (Fiona and Alan from Ireland, and Rutger from Sweden, Ally from the UK) on their break from INSEAD and our guide, a British Vietnamese speaking, liquor brewing entrepreneur and restauranteur with a passion and enthusiasm for Vietnam and the cultures within it that is infectious. By midday and one breakdown later I realise that I'm with a great bunch of people and a whole lot of laughter is going to happen on this trip. Fortunately the Minsk is relatively easy to fix when you have the right mechanic (the first guy we found looked for the battery - and the Minsk doesn't have one!) and we were soon on our way again heading towards Lang Son and the Mui Son mountain. Every bit of arable land is worked and picturesque rice fields look like patchwork quilts as we ride on by. Soon hilly Karsts loom around us covered in dense green vegetation, and it feels like we have stepped into some kind of middleworld of fairy tales where dragons abound! There is a strong drinking culture in this area, and people indulge in various flavours of corn liquor and rice wine with ranges of herbal and animal (snake etc) flavourings which they believe have certain medicinal properties. There is an art and a certain approach to drinking the shot glasses of liquor, and our guide instructs us in the etiquette of whether to hold your cup higher or lower than your host, whether it's a group drink, a one on one drink and when you can refuse a drink (almost never - unless you have a darn good reason like "for medical reasons" which I used vociferously by the second day of the trip). There is an expectation that you join your host in a drink - it gives a sense of feeling or friendship between you and he gauges the measure of you in the process. The rounds of liquor would keep coming over the next few days and this was for me the hardest part of the trip. Not being the biggest drinker, I would eventually decline up front, which sets you aside socially in the interactions with the Vietnamese locals we would meet. Meals themselves are protracted affairs with multiple dishes in the middle of the table to be shared with everyone. Rice is offered last, after you have snacked on the other dishes like beef and squid and vegetables, and is to fill you up and provide some substance so that you can hold your liquor! The concept of one person having a dish to themselves is regarded as strange and meals were consequently very social and great fun. We head on to Cao Bang, moving through mountain passes and freewheeling on the downhills with the engines off - a feeling strangely like skydiving freefall. Here and there we stop for a drink in the local villages we pass through. No english is spoken and three way conversations are held through our guide, who ensures that both the locals and we know what is being said and opens doors of interaction with locals that were truly special and 'real' encounters way off the tourist track. Children and adults alike look at us with bemused expressions that turn into broad smiles as soon as we smile and wave at them. I feel absolutely emerged in a culture that is strange and new to me and I delight at the experience. Dan continues to amaze by whipping out Camembert Cheese to complement our French style picnic lunches on the roadside, complete with chocolate for desert! We are often watched by curious local minority tribes - the children running away as we approach them, shrieking with laughter, the babies staring in horror at these big white giants and reaching for their moms. Digital cameras break down barriers, and once the people realise that their images can be seen on the tiny screen we are mobbed by children and adults alike who marvel at their faces on these tiny cameras. By the third day, we have become fairly proficient on our bikes as we head up to Hang Pac Bo, 3km from the Chinese Border and a sacred ground for Vietnamese revolutionaries as this is where Ho Chi Minh re-entered Vietnam after 30 years abroad and lived in the cave here waiting for WW2 to end. Lenin Creek and Karl Marx Peak are in the area (named by Ho Chi Minh). It is a tranquil spot, but this tranquility is soon shattered when we test our proficiency on the bikes by going through what our guide refers to as a bit of a "sticky" pass, that will mostly require your first gear...yeah right. The gutsy bikes assume a life of their own as we bound and bounce over rocks and stones along a mountainous road, fighting to maintain control - taking in the view becomes a secondary matter to surviving the road and not careering off the edge of it and into the valley below, or losing control on the downhills. Focuses the mind! And the reward is a spectacular view at the top, a grassy plain for a picnic and a chance to catch our breath before we resume our journey. We stop in at the tail end of a market, with predominantly Tay tribe people wearing deep blue or black clothing, sometimes with machete knives sheathed behind them. Some younger girls are in gingham checked tops with black pants, older woman smile at us with black teeth (no dental hygiene here!) The bustle is dying down and we have seen some people along the way heading home with pigs and corn. We have our cameras out, but are quickly reprimanded by the police who insist we must leave. It is unusual for them to see westerners here, and we are very close to the Chinese border so a very officious khaki green clad policeman heads off to call his captain as he is not sure what to do with us. We head slowly back to our bikes and await the captain and our fate - the verdict, when he arrives, is that if we had a permit to stay in the area, he could invite us for a drink, but we don't so perhaps we should leave, however, if we had a permit...we leave. Our base in Cao Bang includes a day trip out to Ban Gioc Waterfall, with a vertical drop of 53m and a span of 300 m. It is quite beautiful and right on the border of China - and we have a moment of setting foot in China as we step off our bamboo pontoon whilst enjoying a leisurely picnic lunch with a waterfall backdrop. It's quite surreal to be in such a beautiful place that's not overrun by tourists - no westerners for miles around, and in fact it is only on our 4th day when we head down to Ba Be lakes that we nearly fall off our bikes when we see a small group of Westerners and feel like they're intruding in our private world! We look at them like they belong to some far flung tribe as we drive past! Ba Be means three bays and is actually three linked lakes in a large national park. Bits of forest reminiscent of Knysna...We have a day off here on a boat, swimming and relaxing and indulging in a long lunch with Om Hiem (Uncle Pirate) who is like a Vietnamese Crocodile Dundee with a quick smile, bright eyes, the standard blackening teeth - and a capacity to drink! I let my fellow travellers fly the drinking flag again. We stay with Mr Dang and his family (5 sons) who join us around dinner for the obligatory drink. Their home is on the shores of the lake, their youngest son is up at 4am fishing on it, and Fiona helps Mrs Dang shepherd her buffalo out of the water in the early morning. The blue green waters of the lake are surrounded by mountains of green bush and bamboo and we while away some hours floating around on inner tubes, or watching games of 'try and tip me out of my tube!" We have made it back to Hanoi, driving right into the increasingly busy roads and arriving in the city centre in one piece - no mean feat in a country which seems to have no apparent rule of the road, just cars and trucks and bikes and bicycles and people moving in seemingly random directions. But then you get used to the flow, you anticipate the line of movement of traffic around you and make sure you move around it, it takes a while to get used to, but it works. As our guide often pointed out to us in the trip, there is a logic to the way things are done here, it's just not our logic, which makes it seem strange, but not necessarily wrong. It still results in Fiona declaring loudly in her broad Irish accent as we arrive at our final stop "I am so @#$%ing glad to be alive lads!" and then bursting out into her usual loud laugh that has us all in stiches. Over the last week we have covered 1100km on our bikes over sealed and sandy roads, rocky terrain and through rivers streams and single track paths. I can use my horn like a local, and shake my head irritably with any driver who doesn't hoot at me to let me know he's about to overtake me - honestly, where is his driving etiquette! We have dodged ditsy chickens who have dithered about crossing the road (now I know where that joke comes from), avoided with more care dogs, pigs, buffaloes and children, begged for someone to plant a different song in our brain (Guantanemera can drive you mad if you don't know all the words! ), sang loudly at karaoke, amongst strangers, and with strangers who have become friends. We have slept in hotels, on floors of stilted houses and dozed on mechanics workshop floors as bikes were fixed (Fiona now knows you need to use a clutch to change gears), shared jokes, life stories, have had the privilege of interacting in people's lives in a way I would not have thought possible. We have even become proficient motorbike riders. 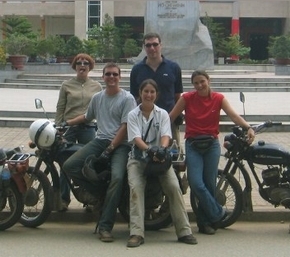 But it has been so much more than a motorbiking experience that I want to burst with the telling of it. I wish you all could have been there - it's an experience of a lifetime.